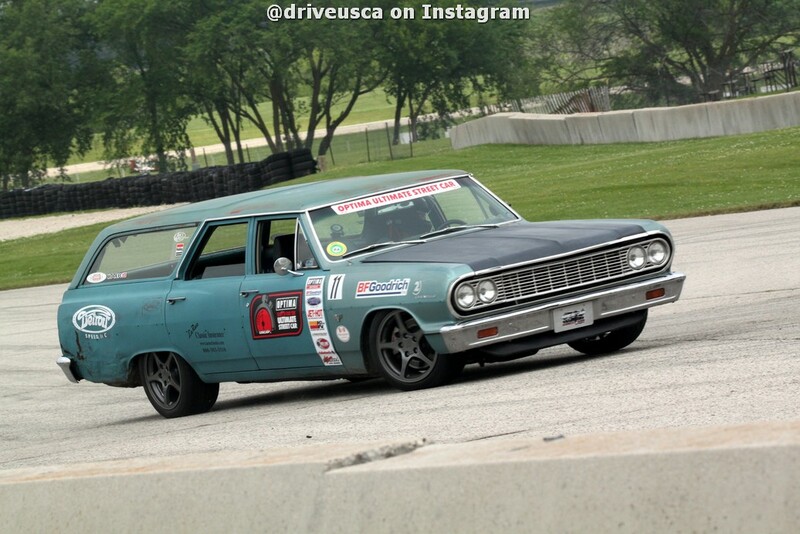 Deb Farrington's 1964 Chevrolet Chevelle station wagon picked up a KN Filters Spirit of the Event invitation to the 2014 OPTIMA Ultimate Street Car Invitational (OUSCI) at the Ultimate Street Car Association (USCA) event at Road America and we couldn't think of a more deserving person. The Farrington family are no strangers to OUSCI competition, with husband Tom having competed in the past in one of the family's other Chevelles and they are fixtures on the Pro-Touring circuit, whether that is at USCA events, Goodguys shows, American Street Car Series events or any number of other events that might pop up around the country. While the OUSCI Event Directors get plenty of requests every year, from folks who can find time in their schedule to come to SEMA and the OUSCI, but never manage to fit in a qualifying event, the Farrington family is the polar opposite. They make time to do other things around their car schedule. "We have been continuing to run the cars any chance we get," says Deb. "We're building a new shop right now, remodeling the house and spending as much time with our new grandson as possible." With summer quickly coming to an end, their son, Sam (the youngest competitor in USCA history) is back in school as well, with a full slate of school activities. Deb's invite came all the way back in June, so it wasn't really a question of whether or not they would make changes to the wagon, but which changes would be made, while juggling everything else in their schedule. "The list of wants and needs became rather long, so we decided to fix the items that had been on the list for a while and see where we ended up after that," says Farrington. First on the list was a Baer brake upgrade, followed by an exhaust fix. "We had cut the tailpipes off when we did the motor upgrade and fuel tank change last year and had never gotten around to replacing the entire exhaust system, even though it has been in a box in the shop," admits Deb. "We are also going back to the stock fuel tank with the Aeromotive fuel pump system, which is a change I am very excited about." Yes, you read that right. Deb is excited about her Aeromotive fuel pump system. Can you see how she earned the Spirit of the Event invite? A few other smaller items will be buttoned up before the wagon hits the trail and heads West, including replacing the windshield, remounting the remote reservoirs for the coilover shocks and just a general cleaning of the car, which weighs in at just under 4,000 pounds. The ZZ4 crate engine is mated to a Tremec transmission and is rated at 350 horsepower at the flywheel. Deb knows it is a heavy car and underpowered compared to many of the other competitors, but she is ok with that. "It's still a blast to drive!" says Farrington. While Deb has competed in many autocross and road course events over the last five years, as well as attending the 10/10ths Driving School, her knowledge of the track at the Las Vegas Motor Speedway is limited. "I have seen the track, but that's about it," she says. "I couldn't make a good guess at the cars it will favor, but I hope it favors a heavy, slower wagon." Regardless of how the wagon performs on the track, we know Deb will have a great time and represent her sponsors well, which include Detroit Speed Engineering, Alex LaRue Insurance, Bowler Performance Transmissions, Aeromotive, Royal Purple, Baer Brakes, Mast Motorsports and all the guys at BFGoodrich.